The high school I attended was beside a river, which gave us the great opportunity to canoe during gym class every year. My friend Nick and I decided to be partners the first year and it went so well that we partnered up every year after. We were good together, our paddling was strong and in sync and our canoe moved through the water like a shark stalking it’s prey. Our favorite thing was to paddle straight towards the base of the bridge as fast as we could then at the last second turn our paddles so the canoe turned sideways and floated gently up to the pier. It was like parallel parking a canoe. As good as we were though we always ended up in the water as an example of how to rescue a flipped canoe. Sometimes it was our choice to go in, but usually it was our stupidity that put us in the water. We were doing an exercise practicing switching places while on the water. 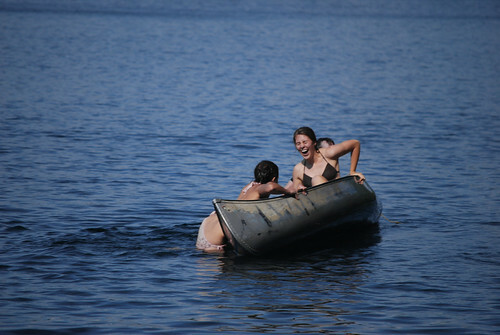 I had been in the front of the canoe and we managed to switch places and I was stabilizing the canoe from the back seat. All that was left was for Nick to move up to the front and get himself situated. When he went to step over the front seat he caught his foot and caught himself on the side of the canoe pushing it into the water, then to compensate he fell the other way pushing it into the water, by the time he got balanced it was too late, our canoe was filled with water. There we sat, paddles in hand ready to go, but we went nowhere. We were sinking. The teacher was yelling at us to get out and turn the canoe over before it ended up on the bottom of the river. We rescued the canoe and once again it was Tim and Nick floating in the river waiting to be rescued. I don’t know if I heard this saying somewhere or if I came up with it myself, but for now I’m taking credit for it. Don’t rock the boat unless you’re ready for it to go over. We all want to change the world and we all will in some form or another, but sometimes we get so obsessed with changing things now that we end up doing more damage than good. Once that boat starts to rock it could go over at anytime and once you’re in the water you’re committed. You’re either ready or you’re not. Sometimes life will tip the boat on us when we’re not ready and sometimes we’ll do whatever we can to keep the boat upright because we don’t think we’re ready. At some point the boats in your life are going to tip over, will you be ready? What boat are you ready to tip?